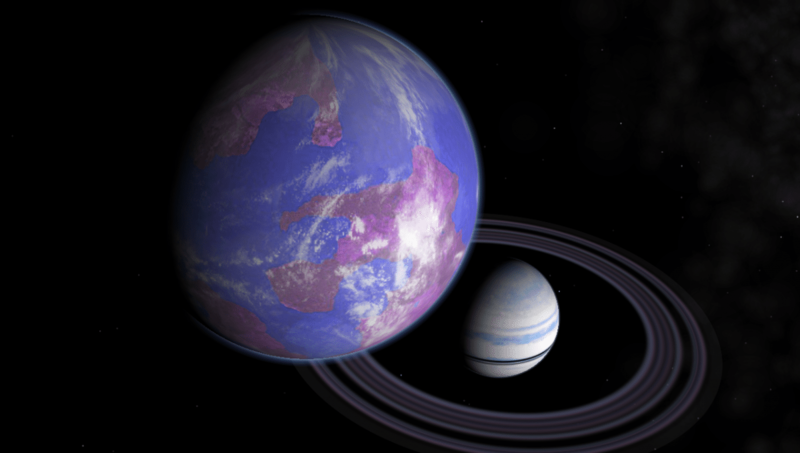 The majority of exoplanets we’ve discovered has been in one of two ways. The first is known as the transit method. In this method a planet’s orbit is aligned so that it passes in front of its star on a regular basis. As it does so, it blocks some of the light coming from the star, making it appear dimmer. By observing the brightness of a star over time you can detect the regular dimming to determine the orbit and size of the planet. Of course this only works if the orbit is aligned just so. The other common method is known as the radial velocity method. This method uses the fact that a star with planets will wobble slightly. It is due to Newton’s third law of motion (action-reaction), so that as the star gravitationally pulls on a planet to keep it in orbit, the planet pulls back on the star. So as the planets orbit the star, the star wobbles slightly as a result. We can measure this wobble due to the Doppler effect of light. There is, however, a third way to detect planets, known as microlensing. Gravitational microlensing occurs when the light from a distant star is bent by the gravitational field of a closer star. When we observe a distant star directly, we only see the light that came from the star in our direction. But when a closer star lines up with a distant star from our point of view, the light of the distant star is bent slightly. The closer star focuses the light of the distant star, making the distant star appear a bit brighter for a while. The close star acts as a gravitational lens, hence the term. Now if the star has a planet, then the brightening of the background star won’t be uniform. Instead of a gradual brightening and dimming, you get an additional spike in brightness. By measuring these spikes you can determine the presence of planets orbiting the close star. Gravitational microlensing only occurs when a close star aligns with a distant star from our vantage point, so detecting planets by gravitational microlensing isn’t a trick we can use very often. In fact, only 15 planets have been discovered in this way. But now a new paper on the arxiv presents evidence of a moon orbiting a planet orbiting a star. The main planet orbits a star known as MOA-2011-BLG-293L, a K-class star (about 90% the mass of our Sun) about 25,000 light years away. The formal publication announcing the discovery of the planet (MOA-2011-BLG-293L-b) just hit the press in the Astrophysical Journal this week (you can see the arxiv version here). The planet has a mass of about 3-5 Jupiters, and has about a 50% chance of being in the star’s habitable zone. Credit: D.P. Bennett, V. Batista, I.A. Bond, C.S., et al. Evidence for the moon is summarized in the image here. In the top graph you can see the microlens brightening of the star by the planet, where the black line is the curve expected by the planet alone. In the bottom figure, the region in the orange rectangle is expanded. The dotted line represents the curve expected by the planet alone. As you can see, the actual curve has a peak relative to that, which is the effect of the moon. That small peak is the evidence of a moon around a jovian planet around a star 25,000 light years away. Before we get too excited, while the “best” solution to the data has the planet with a moon in the habitable zone of the star, there is an alternate solution that fits the data nearly as well. In the alternative solution, the lensing is caused by a red dwarf star with a planet of about 20 earth masses. It all depends on whether our star is the one doing the lensing or the one being lensed. Even if we haven’t discovered a moon around a planet, the observations show that such an effect can be detected. To even be talking about the possibility of discovering moons around distant planets is pretty extraordinary. Paper: Batista V, Beaulieu J-, Gould A, et al. 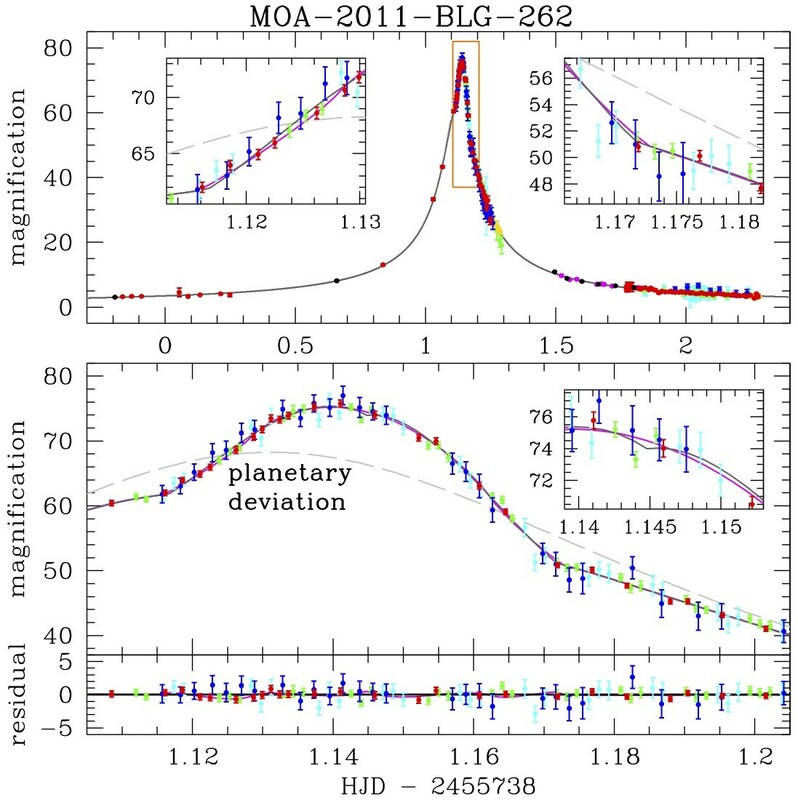 MOA-2011-BLG-293LB: FIRST MICROLENSING PLANET POSSIBLY IN THE HABITABLE ZONE. ApJ. 2014;780(1):54-.